February typically brings with it a lot of harsh winter weather, and it's something for which professional truckers often feel prepared. However, given the risks involved, it's vital for both managers and haulers themselves do more to make sure they're doing all they can to follow every basic tenet of winter driving safety to the letter. Perhaps the most important aspects of winter safety is doing all the appropriate homework and maintaining constant communication, according to Go By Truck. 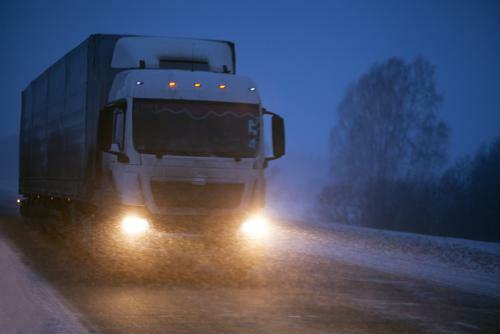 When drivers know what to expect on the road in terms of harsh weather and treacherous conditions, they're far more likely to avoid running into unexpected issues that could delay their deliveries or even lead to an accident. "There are a few things that we do to keep our drivers safe, and most of it has to do with planning ahead," Marilena Acevedo, vice president of human resources at PetroChoice, told the site. "We make sure that our leadership and drivers work together, plan out the haul usually a couple of days in advance, especially when we have notifications that the weather is going to be bad." Beyond that, companies would also be wise to provide winter-weather training on an annual basis, and make sure drivers have the right equipment in their trucks, the report said. It's vital for drivers to consistently inspect their trucks to ensure they have enough antifreeze, that their tires are all properly inflated and so on. One of the biggest and best ways drivers can avoid issues when winter weather strikes is to simply slow down, Fleet Owner advised. That might mean allowing for extra time to make a delivery, but all involved would rather drivers take an extra few hours to complete a run than not do it at all. Drivers should always try to take it slow, but the increased risk of slick roads and more traffic during the winter makes this especially important. In addition, drivers should always know alternate routes to their destinations they can take when roads become too dangerous, impassable or simply too thick with traffic, the report said. This is also true of understanding where they can park safely, because in winter months especially, pulling over to the side of the road is never a good idea. The risks associated with truckers running out of safe places to park has become such an issue in much of the Midwest that a number of states recently came together to give drivers more information, according to the Garden City Telegram. The new Truck Parking Information Management System is used by eight states in the region, and provides drivers with nearly real-time information about where there's parking available and which lots on their routes may be full. That can be especially important when dangerous winter weather conditions arrive. When drivers have a better handle on winter safety - and safety in general - they are more likely to feel good about their jobs. When freight companies can combine that with high pay and better benefits, they may be more likely to both attract and retain talent in the industry.